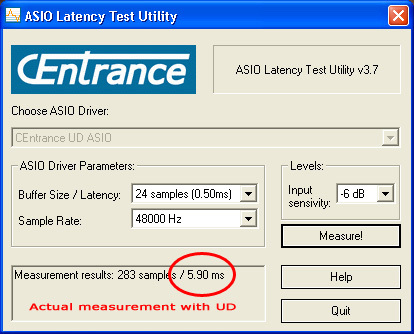 If you’re wondering how your audio interface is performing on Windows with ASIO drivers, CEntrance has released a free utility that measures latency. Latency is the delay in transit as an audio signal performs a trip through your interface. Looks handy, and you know what this means: time to post some Windows driver/interface benchmarks! Measure away, and let us know how it goes! Keep in mind, you can take advantage of everyone’s favorite Windows driver, ASIO4ALL, to provide higher performance for even audio devices (like an internal laptop card) that don’t have ASIO drivers. I’d love to measure WDM/DirectX Windows driver latency, which is where problems usually occur, though I’m not sure I’d like the results. For those of you not in the know, ASIO is generally the way to go. Let us know how much latency you get; reply here.